THE EARRINGS. The earrings were laser-cut onto 7×7 inch sheets of bamboo veneer inside a warehouse in West Oakland. They were shipped to an apartment about two miles away. They were assembled there by hand, using antique bronze hooks, pliers and some other craft tools. Then a few dozen pairs were sent to Oaklandish, local retailer and staunch supporter of anything Oakland-themed and Oakland-made, where Libby Schaaf, who was running for office, spotted them while shopping. Schaaf bought the earrings and wore them on her campaign trail. She wore them when she received Jerry Brown’s endorsement during the final stretch of her campaign. She wore them at her Newly Elected Mayor of Oakland celebration party, as she rallied a crowd of Oaklanders while steering a giant, fire-breathing snail. There’s a good chance that she’s wearing them now. A few days after the election, Phillip Yip, the 34-year-old founder and designer of Antietam Designs, sat on the rug in the living room of his Oakland apartment, assembling more sets of his now locally-known Oakland Tree Earrings. Based on the city’s ubiquitous logo (found on street signs, construction barriers, even trash cans), the earring set has been in demand by local retailers like Oaklandish, LuckyLo and LOAKAL, and is one of several accessories inspired by what Yip characterizes as Oakland’s culture. Other items include a tandem bicycle necklace (a nod to Yip’s rides around the streets and hills of Oakland with his wife); “latte art” necklace (modeled after a real rosetta poured into a real latte by a local barista); and a pair of stud earrings laser- cut into the shape of the Port of Oakland cargo cranes. “It was kind of my way of somehow exhibiting pride in the city, you know?” Yip said. His process – for the Tree Earrings, for example – begins with popping each oak tree piece from the sheet of bamboo, examining it with precision, flicking it with just enough force to shake out any excess bits of bamboo without damaging it, removing the protective backing, and setting it aside to be assembled and packaged later. Yes! I love your jewelry and wear it with pride! If you watch the video on the Oakland North page, you’ll notice that not only am I wearing BOTH your earrings and necklace, but so is the newly elected Councilmember for District 4 Annie Campbell Washington. We are both passionate localists! Yip works fulltime engineering bike lights for a company in Emeryville, but in the hours before and after considers himself a designer, a photographer, and a “maker,” the term used these days to describe independent inventors, designers, engineers, artists, hobbyists and tinkerers. Yip eventually moved to Oakland for work, and in 2011 decided he might, as he put it, “give that jewelry thing a try.” He called his company Antietam Designs, after his college dormitory, named for the Civil War’s Battle of Antietam. 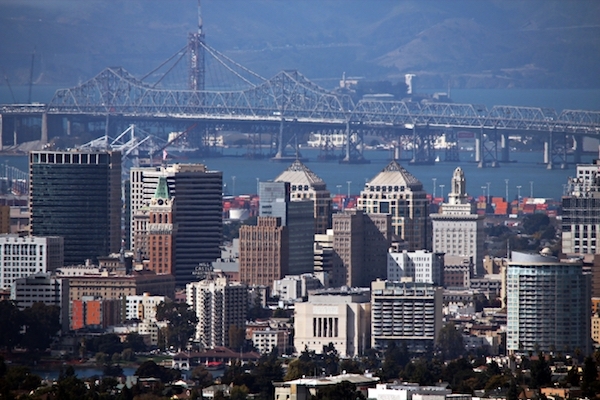 Yip wanted to work with an Oakland-based supplier to support the city’s economy. He discovered Ponoko, an online service for designers, makers, Etsy sellers, Kickstarter entrepreneurs and other businesses to make and sell their products. Through Ponoko, makers like Yip upload their graphic designs online and choose the material from a variety of materials. The designs are then cut and engraved at one of 12 digital “making hubs” across the US, Europe and New Zealand, depending on where they’ll be shipped. One of Ponoko’s hubs happens to be the warehouse in West Oakland, adding to the area’s list of maker spaces (others include NIMBY, The Crucible, American Steel Studios, Ace Monster Toys, The ACME Warehouse, John Sarriugarte’s Form and Reform, John Lewis Glass, and Jeremy Crandell’s Saint Louise Studios). Ponoko then ships the laser-cut items directly to their clients for assembly. “The general idea is that you upload something to the site, and then as quickly as the next day, you can get it and have it in your hands,” said Ponoko’s U.S. Manager Dan Devorkin. Devorkin said hundreds of Oakland-based makers use Ponoko. Users range from people who place one-off orders for gifts or holiday decorations to established makers like Yip, who place multiple bulk orders for their creative brands. Yip likes to say Oakland is unique in its support of a maker movement that takes so much pride in the city itself. In many cities, he says, people sporting iconography might be perceived as tourists. But in Oakland, Yip says, people who wear T-shirts with graphics of the Bay Bridge or a big oak tree — they’re definitely locals. As a way of furthering his Oakland iconography, Yip has a few more designs in mind, including a new Lake Merritt-inspired necklace made from laser-cut bamboo and blue felt. Antietam Designs’ Oakland Tree Earrings, in progress. Phillip Yip assembles the Oakland Tree Earrings.